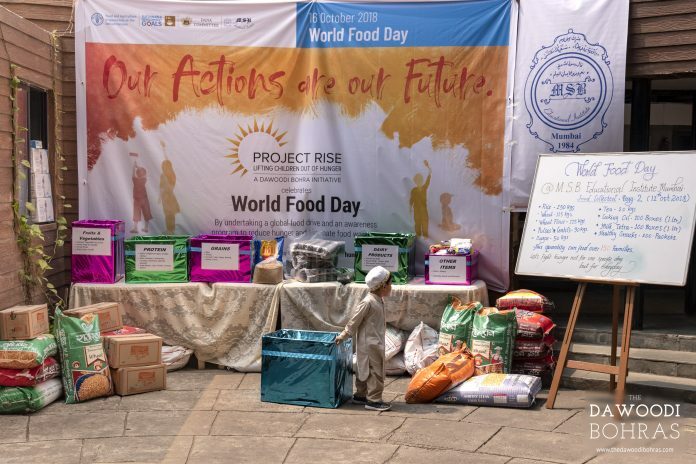 To commemorate World Food Day, students across a 100 cities worldwide in conjunction with local Dana and FMB committees are currently engaged in various activities to create awareness about global hunger and food wastage under the Project Rise community initiative. This year’s theme for World Food Day titled ‘Our Actions are our Future’ focuses on engaging young people and educators to work towards the ultimate goal of zero hunger by the year 2030. 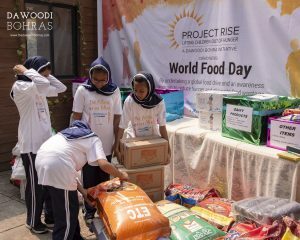 In light of these timeless values imparted by Islam, and in keeping with contemporary global efforts to combat the rise of hunger and food waste, the Dawoodi Bohra community’s Project Rise initiative has seen students and teachers across the world joining the cause. From the 11th to the 18th of October, students and faculty alike will partner with local FMB and Dana committees along with other NGOs to organise a host of activities. Food banks have been set up in more than a 120 community centres worldwide and have effectively collected tonnes of non perishable food items which are then handed over to charities or to the those in need directly. Awareness walks have been organised with students carrying placards and taking to the streets in order to create awareness on a grassroot level. Students have also attended lectures and talks on the subject of global hunger and food waste to broaden their own horizons and appreciate the movement on a more intellectual level. 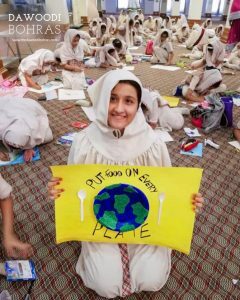 A poster making competition has seen students exercise their creative faculties to artistically depict the phenomenon of global hunger and suggest ways in which the problem can be tackled through innovative practices. Empowering and educating the younger generations is crucial to a world without hunger, especially when there is sufficient food produced for all of humanity but most of it is wasted, leaving millions in a state of chronic hunger and malnutrition. Project Rise is dedicated to fighting hunger through a variety of approaches with sustained partnerships and continued effort towards eliminating hunger resulting from waste.